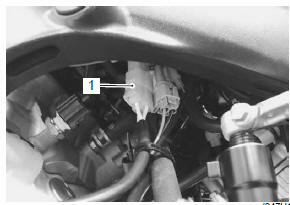 Disconnect the generator coupler (1). Measure the resistance between the three lead wires. If the resistance is out of specified value, replace the stator with a new one. Also, check that the generator core is insulated properly. Start the engine and keep it running at 5 000 r/min. Using the multi-circuit tester, measure the voltage between three lead wires. If the tester reads under the specified value, replace the generator with a new one.